#1 - I spent the entire next day editing & mastering the CD with my audio engineer. #2 - My best friend from TX arrived the following day. 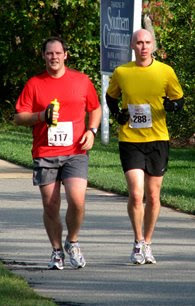 #3 - I ran my first half marathon the following day. #4 - Vegging on the couch for 2 days straight to recover from said half marathon. The 2nd recording session went well but was fraught with a cacophony of sounds from several sources: cars, trucks, motorcycles, planes, trains, church bells, lawnmowers, leaf blowers, and even a shopping cart being rolled noisily down a hallway. I am not a fan of recording in a dry-sounding studio and adding reverb/ambient sound post-production. I would much prefer find a place with great acoustics that records well. In this case, I used a church sanctuary here in Greensboro that is located on a well-traveled road at an intersection with a stoplight, which explains most of the vehicular noises I mentioned. When I booked the space, they neglected to tell me Wednesday was lawn mowing day, so we side-stepped those noises with a well-placed lunch break. The first half of the session was a blast. I was joined by a phenomenal hand drummer (and orchestral percussionist) from the area for two of the tracks on the album – God Rest Ye, Merry Gentlemen & Deck the Halls. When neither of us showed up to the session with a metronome to check tempi, I turned to my trusty iPhone, searched the App Store, and had downloaded a free metronome to my phone within 2 minutes. Thank you, Apple. The latter half of the session left me all alone with my marimba and recording engineer for what ended up being a VERY stressful 4 hours. But we got it all and I'm very happy with the sound we ended up with. The CD shipment arrives Monday 11/3, so if you want to buy one (or 50), GO HERE. Hands down, recording is one of my least favorite aspects of performing. Whether it is the cursed expectation of perfection from future listeners (or myself) or the knowledge I only have a limited amount of time to achieve this "perfection," I do not know. Either way, I knew going into the first of two recording sessions for my Christmas CD this morning that I needed to check my aversion at the door. I remember recording this guy playing a solo clarinet piece I wrote back in my grad school days. He told me how much he loved recording ... that he actually found it fun and liberating. Me, I must have looked at him (and probably looked at him) as if he were nuts. Anyway, it was helpful to look back on how cool and collected he was as I mentally prepared for today, hopefully channeling his positive energy. The purpose of today's recording session was to record the four marimba quartet arrangements that will be appearing on the album: God Rest Ye, Merry Gentlemen, Silent Night, Deck the Halls, and A Winter Postlude (Jingle Bells). I was surrounded by some of the best marimba players in Greensboro. With their consistency, accuracy, and musicianship, they certainly helped me to have fun and take my mind off the fact that we were surrounded by microphones and that the recording engineer kept pressing that blessed "Record" button. After the quartets went off without a hitch, I was feeling confident (and we had time to spare), so I recorded a couple of the solo tracks: A Winter Prelude (Jingle Bells) and Carol of the Bells. I was joined by one of the quartet members on the latter of the two pieces on orchestra bells. Here's a sneak preview (read: unedited & raw) of that piece. I'm really happy with how all has gone so far. Ugh ... hands are starting to sweat ... having trouble breathing. And the process starts all over again. Apparently all it took to inspire my latest CD project was the confusion of one of my running group friends over my last blog entry. She thought that I actually had a CD filled with the Christmas marimba arrangements in my new book. I was planning to do lesser quality recordings of each tune for demo purposes, but if I'm going to spend time doing that, I might as well do it right. However, with it being October and all, I have had to fast-track the entire project in order to have it ready for sale at PASIC and just generally out in time for the holidays. Should be released by the first week in November. I'm keeping my fingers crossed. Anyone like to celebrate Christmas all year round? I've had the pleasure of doing so whilst writing a new collection of Christmas arrangements for solo marimba! I've been chipping away at it since November of 2007. Actually, I arranged two tunes (Silent Night & God Rest Ye, Merry Gentlemen) and stopped for about 7 months. Here's a YouTube performance of "God Rest" at a clinic I gave in Salem, OR back in December. Please excuse the less-than stellar audio quality (and the wrong note at the end). I started back up in July, planning to do a total of 6 arrangements for the collection until two of my always helpful colleagues (read: opinionated) told me that I needed to do 8 so that the book would be thicker (and therefore more marketable). I just finished the eighth and final arrangement and the collection is now reaching the final stages of the publication process. Here's the list of tunes and the beautiful cover designed by Ed Morgan of navyblue design. Needless to say, I'm pretty excited about the release of this one. It'll be available from my publisher in mid-October, just in time for people to pick it up and learn some festive tunes for Christmas.